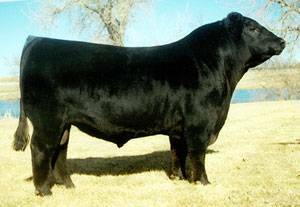 Destroyer is a bull that Doug Hoff, SD purchased an interest in at the 2005 National Western Stock Show. He is a very thick and muscular bull with excellent soundness and feet quality. This pedigree is a bit of an outcross so you can power up your flat-made females in a hurry with Destroyer. The Royce 741C cows are GOOD.